Original Saturday Night Live cast member Chevy Chase does not appear to be a fan of the SNL of 2018. “First of all, between you and me and a lamppost, jeez, I don’t want to put down Lorne (Michaels) or the cast, but I’ll just say, maybe off the record, I’m amazed that Lorne has gone so low. I had to watch a little of it, and I just couldn’t f–king believe it,” Chase told The Washington Post. Saturday Night Live currently consistently mocks President Donald Trump and members of his administration. Schneider also found Alec Baldwin’s portrayal of Trump off-putting. He compared Baldwin unfavorably with Dana Carvey’s imitations of President George H.W. Bush. Saturday Night Live, meanwhile, has managed to maintain steady ratings, which appears to mean nothing to Chase. The 73-year-old Chase, who was one of the show’s original stars when it premiered in 1975, told the Post that he asked Michaels six years ago if he could return as host once again – and Michaels said no, citing his age. 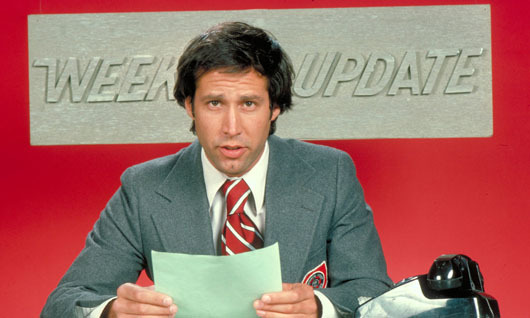 Remember, he’s Chevy Chase – and you’re not.